Felt is non-woven, non-knit fabric that is made of bits of wool or other fur. Felt-making has been around for a very long time… we’re talking about five thousand years. The contemporary method for making felt is similar in science to the ancient method: a combination of pressure, heat, water, and friction make individual fibres cling together into this versatile fabric. Soap doesn’t hurt the process, either. 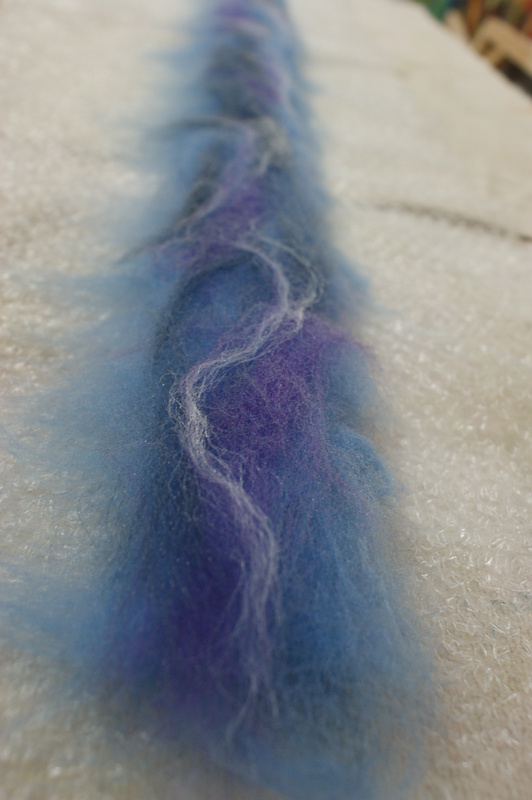 Fluffy wool is layered onto bubble-wrap, sprinkled with soap and boiling water, then rolled up and agitated 'til it is done. I came to start to make my own felt because of three major influences. One, I had always liked felt (and felted) objects. Two, I have a friend who offered to teach another friend and I how to make felt one rainy evening… an evening that also featured soup and beer. The third influence was my own desire to learn another craft that I could possibly make products to sell in my freelance artistic lifestyle. The main reason I keep making felt is that I find it to be a relaxing and enjoyable activity, and I am proud of my creations! 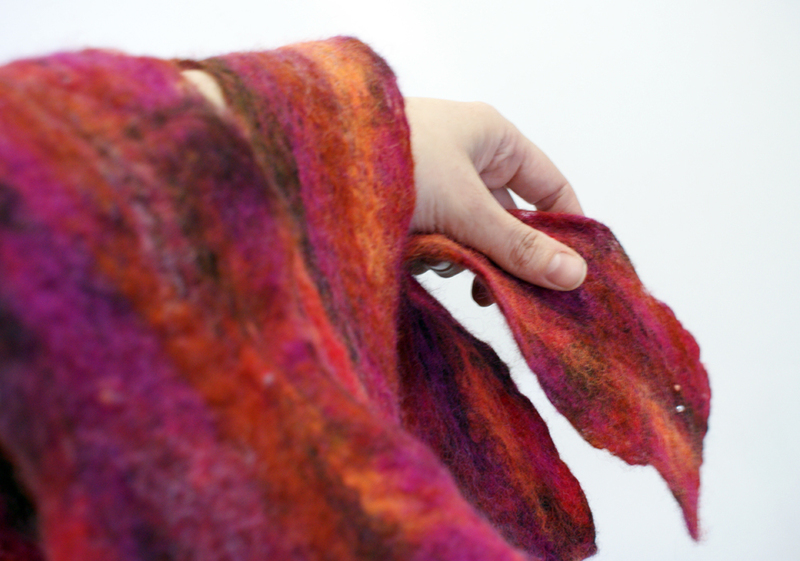 Felt wool scarf with unrecyclable trash built into it and decorative stitching. I also find that the process of laying out thin layers of loose wool in a multitude of available colours to be similar, in an odd way, to painting. My background is as a painter; I’ve painted and exhibited my works for years. So when I found a means to make wearable-art out of an incredibly practical material, I was very, very happy! This craft has opened up new opportunities for me to teach workshops in felt-making, too. There are several people who are curious about this medium, and who want to try things out. I am glad to offer courses in my own studio, and I’ve also had the opportunity to travel to classes to teach kids “how to make felt”. One such event concluded with the kids making their own felt into little puppets. The kids had a satisfying time making their own piece of fabric, and then had a creative time crafting this fabric into their unique creatures. The latest thing I’ve discovered is felted soap. 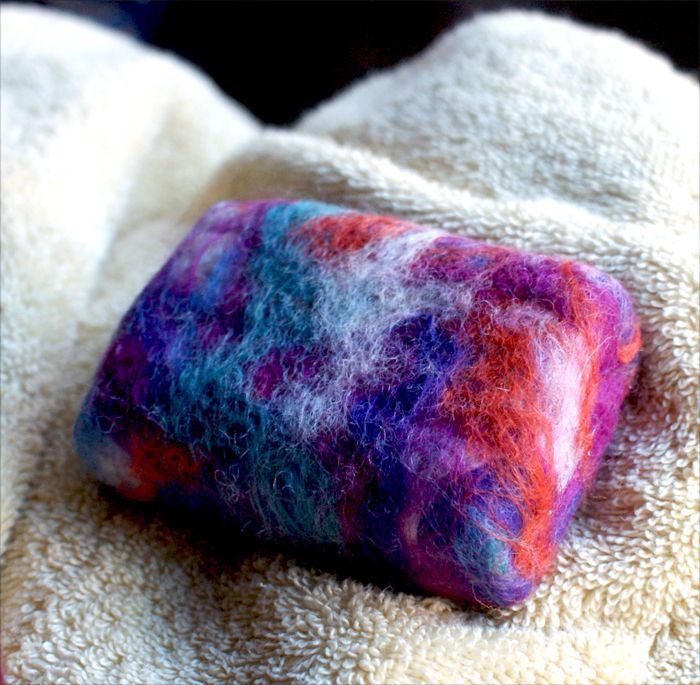 When I first saw felted soap, I thought it would be itchy, that the felt would fall off the soap and you’d find little fibres all throughout the bath… nope. Thankfully wrong on all accounts! The soap inside makes a good lather that keeps the wool at a gentle level of exfoliation. It’s cool, too, that as the soap insides slowly shrinks (these soaps last longer than naked soaps do) so does the felt. Thanks for letting me talk to you about this thing I do. It’s a lot of fun. 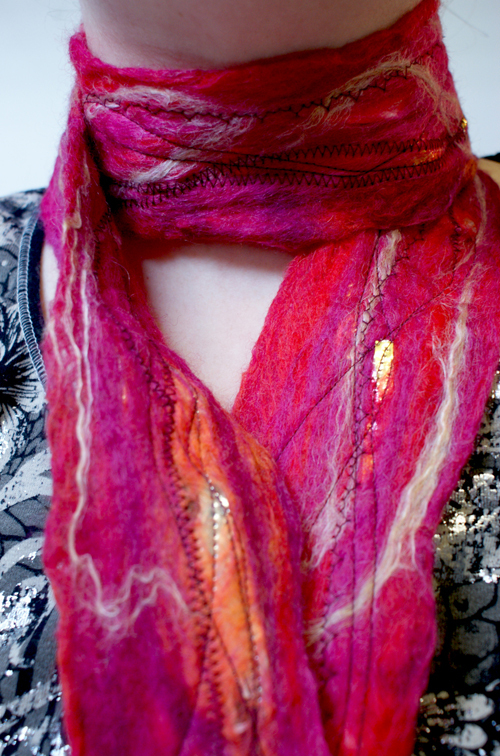 Natasha sells her felt wool scarves and soaps at craft fairs, as well as through her Etsy site, HendersonArt.